It’s not impossible to build a beautiful and functional display of your favorite wines in a limited space. In many parts of the world, converting tiny spaces is a trend among homeowners. 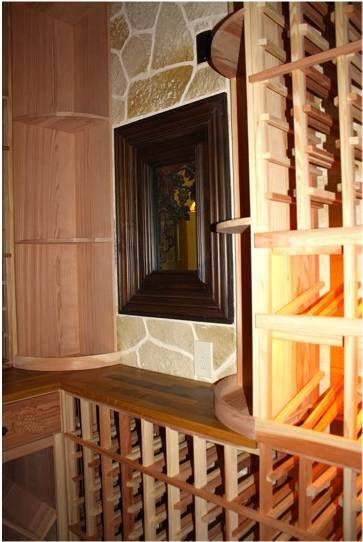 Learn how one of the trusted wine room builders in Texas converted a small room into a stunning home wine cellar. Space constraints should not hinder you from investing in a functional and stylish storage space for your wine collection. Since there are special requirements in wine cellar construction, hiring a master builder can help you achieve all your aesthetic and functional desires for your wine room. A client in Texas was looking for a reliable wine cellar designer and installer who could provide the best storage solution according to the space available. They sought the help of Wine Cellar Specialists, one of our trusted partners in building custom wine cellars in Dallas, Houston, and San Antonio. Their creative and experienced team members always do their best to create stellar wine displays for their client’s collection. They also ensure that every wine cellar they build is equipped with the most suitable components to keep wine safe at all times. In this project, high quality racking, wine cooling system, door, and flooring were used. The overall design of the wine room enhanced the beauty of the client’s home. One of the most important factors that play an important role in the overall appeal of your wine cellar is the design of the wine racks. Before the construction of your wine room begins, Wine Cellar Specialists make an assessment that will allow them to create the perfect racking design for your wine storage facility. 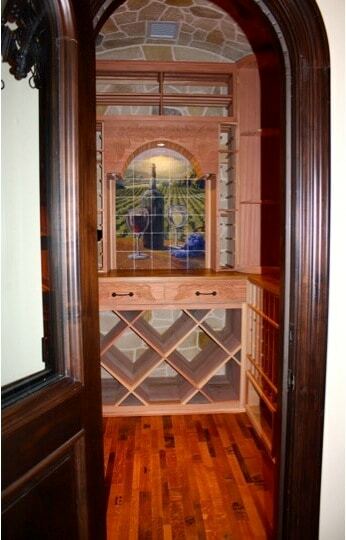 In this project, they used premium redwood for the wine racks. Known for its attractive streaks and swirls, this type of wood can add character to any Texas home wine cellar. As you enter the room, you will see a window to the owner’s kitchen area. They added two quarter-round units on each side of the window. Quarter round wine racks allow for horizontal bottle storage. 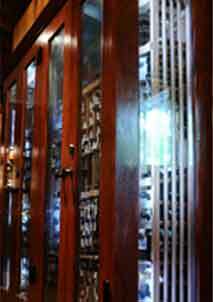 These units can also be used to display other wine cellar accessories, such as decanters and wine glasses. 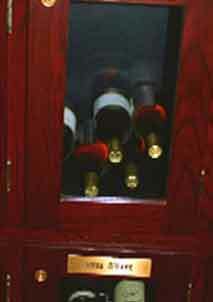 Below the window is a reclaimed wine barrel tabletop, an eco-friendly feature of the wine cellar. It is where the quarter-round storage units sit. Other racking components in the left wall include the individual bottle racks at the top and bottom sections, and a double display row in the middle. The right wall also has individual storage slots at the top and bottom of the racking, and a double display row at the middle section. There are two bin storage cases on each side of the room. Wine Cellar Specialists incorporated special features at the back wall. The bottom section is double deep solid bin wine racking with two drawers on top of it. The drawers come with automatic closure hardware and grapevine handle pulls. On top of these drawers is another tabletop made from reclaimed wine barrels. The focal point of the wine room is the arch that sits on the tabletop at the back wall. Just like the drawers, the arch also has a hand carved grapevine design. A glass rack and an individual magnum bottle column were added on each side of the arch. Wine Cellar Specialists also added the tumbled marble tile behind the arch, an eye-catching feature of this Texas home wine cellar. The wine cellar door was constructed from solid wood with a window on the top half. 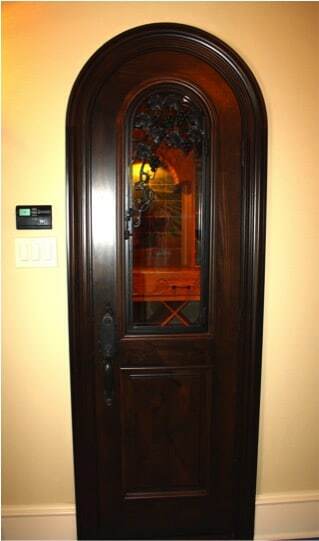 Outside the glass window is an operable wrought iron with a grapevine design that matches the racking. The entryway is equipped with an automatic door bottom to prevent the cool air from escaping the cellar, and the warm air from getting in the wine room. It seals the gap under the door when the door is closed. With quality material and proper sealing components, your wine cellar entryway can help your wine cooling system achieve the stable environment needed for the proper aging of wine. Another green feature of this small wine room is the flooring created from used wine barrels. Wine Cellar Specialists have used this material in many of their residential wine cellar installation projects in Texas. The top and bottom section of the reclaimed barrels were broken into planks and were engineered to create impressive flooring for the client’s cellar. 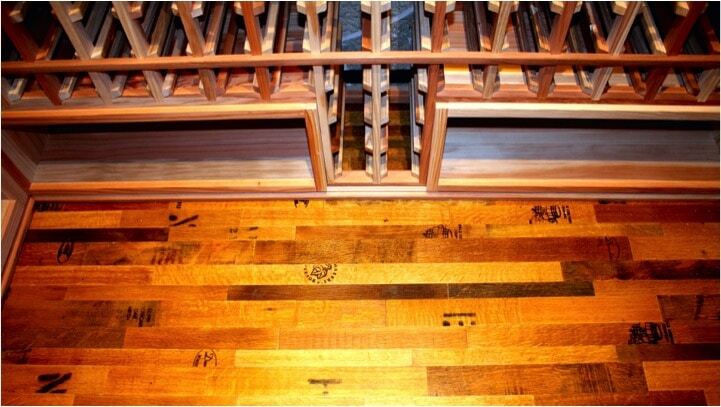 This is called Cooperage flooring, which adds a historic touch to the room because of the unique markings. The markings on the planks came from the vineyards where the barrels were used. Just like the door, walls, and ceiling, Wine Cellar Specialists installed proper insulation to the flooring. This will help create an airtight seal in the wine room, protecting their client’s collection from being ruined by unstable temperatures and humidity levels. Going for reclaimed wine barrel flooring in your next project will not only benefit you, but our environment as well. The most important factor that contributes to proper wine storage is the wine cooling system. Your chosen builder must be able to determine the type and capacity of the refrigeration unit that best suits your wine cellar requirements. 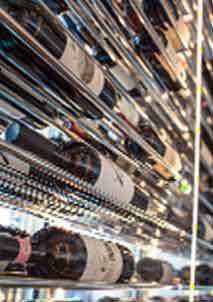 Wine Cellar Specialists selected a self-contained cooling system manufactured by Wine Guardian. 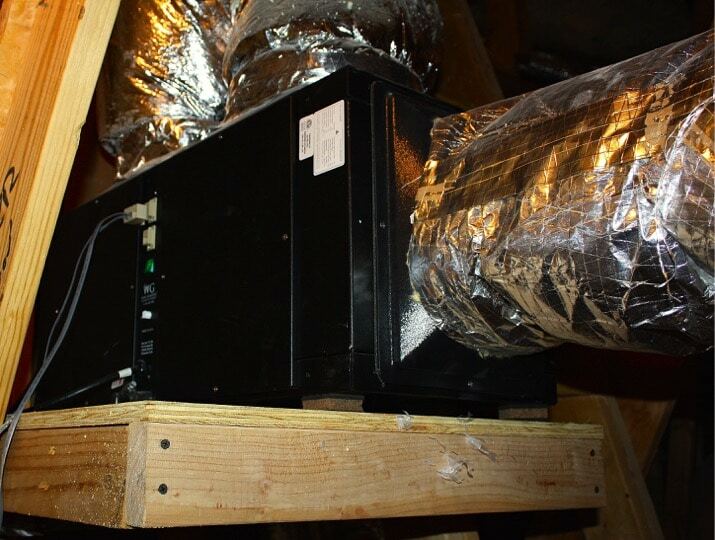 To minimize the noise produced by the cooling equipment, they installed it in an air-conditioned attic above the wine room. In addition, the cooling unit did not take up racking space, allowing for maximum storage capacity. 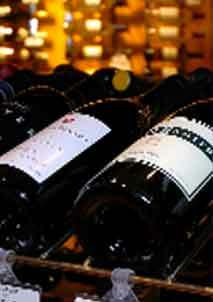 View other wine cooling solutions offered by Wine Cellar Specialists. Space constraints should not stop you from building your own Texas home wine cellar. If you need help, please email Wine Cellar Specialists at info@winecellarspec.com or talk to a specialist at +1 (866) 646-7089.